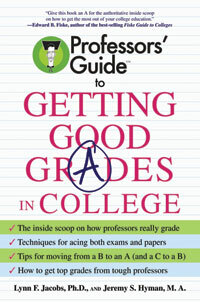 For parents and students who are making a significant investment in time and tuition, the Professors’ Guide to Getting Good Grades in College can be a valuable insurance policy. The book is designed to clue new college students into how the system works and how to get the most out of classes. Lynn F. Jacobs, head of the art department, and co-author Jeremy S. Hyman, a philosophy professor, explore and explode the myths about grading that students bring to college. They offer students the kind of inside information that, if followed, can turn a novice into a scholar who earns grades to be proud of. They offer guidance on working effectively with professors throughout the semester, from the first day of class to the day after final grades come out. The authors steer students toward developing relationships with their instructor and teaching assistants. Jacobs and Hyman stress looking at the big picture and discovering passion in knowledge. They advise students to work towards understanding the structure, context and relationships of the information and ideas they encounter in class. They also caution students about focusing only on a diploma.